After a few weeks of Crazy Rich Asians leading the way, we finally have a new film in the #1 position. No, it's not quite the massive, blockbustery open of last year's IT during the same weekend, but we do have a horror film exceeding expectations and keeping the genre in the spotlight. The latest film in the Conjuring family of movies, The Nun takes us back in time to that malevolent creature's origins, or sort of origins, anyway. The Nun appeared in The Conjuring 2, so it makes sense to give fans of the series a little history of the demon that torments Lorraine Warren. In a bit of fun, Taissa Farmiga, sister of Vera, who plays Lorraine, is the young heroine of the film. 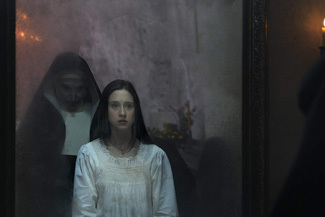 Despite middling reviews (and deservedly so), The Nun broke out big with a $22.4 million Friday, including $5.4 million from its Thursday night sneak previews. That means it had an actual Friday of $17 million. The Conjuring Films have all been super popular, but I'd say that the Annabelle films would be the best point of comparison here since they are spinoffs from the original series. That film had a teensy 2.4 multiplier, which is pretty typical for popular horror franchises. The same for The Nun would mean a $53.8 million debut, but I think that's a little high. Let's just go with $50 million, still good enough for the best opening for The Conjuring series so far, if not the best quality.